Born on October, 23, 1940 in Minas Gerais, Brazil, Edson Arantes do Nascimento would become more commonly known around the world as Pelé. His father, João Ramos do Nascimento, played professional soccer himself, but his career never brought him much in the way of money. As the legend goes, Pelé’s family could not even afford to buy a ball for him, so he stuffed socks and molded them into the shape of a ball to kick around. Pelé 1970 in World Cup for Brazil in Mexico. Although he continued to struggle financially in São Paulo, working a variety of jobs to help his family, the young Pelé found his true talent on the field. Under the tutelage of his father and a former national team player named Waldemar de Brito, Pelé began to mature as a player on the Bauru Athletic Club juniors. Coach de Brito recognized his ability and recommended him for a tryout with Santos FC. The team’s management agreed with de Brito’s assessment and signed Pelé in June of 1956. A mere three months later, Pelé scored a goal in his debut match. Although few people knew it at the time, this foreshadowed the success to come in the rest of Pelé’s professional career. Only a short year later, Pelé topped the list of scorers in the league. His performance, at the tender age of 17, caught the attention of the national team. He would not disappoint. In his first appearance on the world stage, he scored key goals in both the semifinal and the final match of the 1958 World Cup to win it for Brazil. At this point, he had achieved superhero status in Brazil and became a household name around the world. The Brazilian government honored him as a “national treasure,” which elevated his status at home, but also prevented him from taking advantage of offers a broad. Pelé in the Brazilian World Cup team sitting in the middle. On an individual level, the next two World Cups turned out disappointing due to injuries. 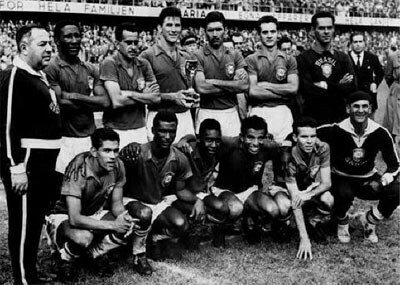 The Brazilian side still won the tournament in 1962, but they fell way short in 1966 without their star player—they were eliminated in the group stage. During this era, though, Pelé continued to excel on his club team, Santos. Consistently a top scorer, he often faced teams who had altered their play specifically to deal with the threat he posed. Despite this, he still managed to score 60 goals in the 1964 season and 101 goals the year after that. By the time 1970 rolled around, Pelé had reportedly decided to hang up his hat and leave while he was on top. However, he was eventually coaxed into playing one last World Cup for Brazil in Mexico on what many consider as the best team in history. Pelé contributed to Brazil’s tournament win with goals and several important assists, earning himself the Golden Ball award for his play. Pelé continued with the Brazilian team for about another year, finally calling it quits in 1971. A few years after that, he said goodbye to his fans at Santos, too. His days as a player were still not over, though. 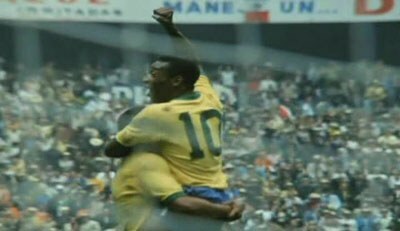 Pelé after scoring in the World Cup final in 1970. Although he had long said that he would only ever play for Santos, he could not resist answering the call from the New York Cosmos in 1975. The North American Soccer League (NASL) represented a significant step down in terms of the level of play that Pelé was accustomed to. The burgeoning league benefitted greatly from this ambassador of the game, though, and ticket sales rose. The American public, largely unfamiliar with the game, took notice. Pelé led the Cosmos to a championship before retiring for good, an event marked by an exhibition match between his adoptive New York team and Santos. At the time of his retirement in 1977, Pelé had amassed a series of seemingly unbreakable records. He had racked up a total of 1,283 goals in 1,363 matches, making him the top scorer in Brazilian national team history and FIFA history. Just as impressively, he managed to pull off 92 hat-tricks. He also set a record for the most FIFA World Cup wins for an individual, with three medals to his name. His early years should not be overlooked, though. The young Pelé burned bright, becoming the youngest player to score a hat-trick and the youngest player to score in a World Cup final match. Retirement saw “O Rei” go on to campaign for a variety of causes, including poverty reduction, anti-corruption movements, and environmental protection. He also received an honorary knighthood, served as the Minister of Sport in Brazil, and assumed the role of a UNICEF Goodwill ambassador. Of course, he never stopped promoting the game throughout the world, including FIFA events and Olympic ceremonies. Perhaps most memorable of all, he popularized the phrase “the beautiful game” as shorthand for the game he loved so much. Generations of enthusiasts have imagined themselves playing with the grace and beauty of “The Black Pearl.” He could strike the ball with astonishing accuracy or flick it off to a teammate through a thick web of defenders’ legs. His iconic goal-scoring bicycle kick in Belgium in 1968 sent young players from all over rushing outside for hours of painful practice. What dazzled many of his fellow players was his uncanny ability to work his way out of almost any situation with sheer skill. For those who have wondered about the origin of the name “Pelé,” the answer proves elusive. 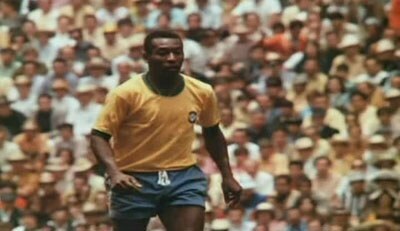 Some have claimed that it came from Pelé’s poor pronunciation of the name of a goalie he admired named “Bilé.” According to this version of events, his teammates half-mockingly gave him the name “Pelé” and he could not shake it. Pelé himself has never given a definitive account of how he got the name. In fact, he claimed he never cared for it much. Like so much else in this superstar’s life, though, the magic lies not in minute biographical details or trivia, but in the legacy that Pelé left on the field.